Here’s the deal: The Master Cleanse and similar cleanses are almost entirely sugar and provide little, if any, nutrients. Even worse, they lack protein. Put simply, your liver is detox ground zero. Everything that detoxifies goes through your liver in two phases. During the first phase, your liver converts fat-soluble toxins into water-soluble substances. In phase two, your liver excretes these water-soluble toxins via urine, sweat, and other bodily fluids. Here’s the takeaway: if you don’t have protein, your liver can’t perform that second phase. That means highly toxic metabolites hang around and wreak havoc in your body. And let’s be honest here: most people do cleanses for fast weight loss, not true detox. Maybe you want to burn 10 pounds before your friend’s wedding or work fast to fit into a smaller pair of jeans. You’ll probably lose some weight on these super low-calorie, near-starvation diets. But most of that weight loss comes not from fat, but water and lean muscle tissue. You’re literally wasting your body away. Now that you know better, how do you choose a smart plan that includes plenty of protein and nutrients to help your body effectively detox? 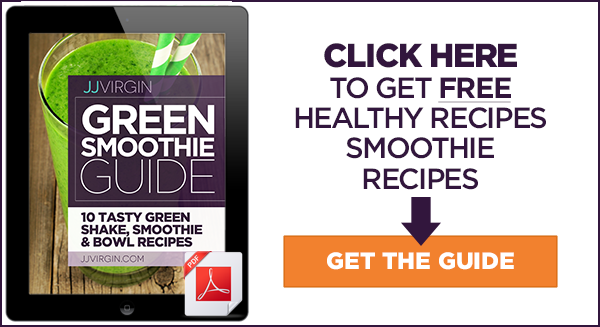 If you want directions and recipes for a complete, healthy 7-day cleanse, grab the free guide at the end of this blog. In the meantime, start by dumping the processed foods, gluten, artificial sweeteners, alcohol, and caffeine. (If you’re a monster without your morning Starbucks, gradually taper off the coffee.) Replace them with the healthy foods listed below. And if you want an extra boost of detoxifying greens and protein, you can also add a scoop of Green Smoothie Cleanse to your morning shake or glass of almond milk. So what else should you eat while you’re detoxing? Sulfur-containing foods. Broccoli, cabbage, and onions all provide sulfur to boost the seocnd phase of detoxification. Fiber. If you’re not eliminating, you’re not detoxifying! Legumes, raw nuts and seeds, berries, apples, and lentils come packed with fiber. Always buy organic if you can. Aim for 50 grams of fiber a day. Water. Pure spring water in between meals supports healthy digestion. I also like antioxidant-rich organic green tea and coconut water to supply your body with electrolytes. Not only will you get a detox boost from these foods and drinking plenty of water, you’re also setting up your system to burn fat and build muscle every day. I’ll take that over going hungry or a fridge full of expensive designer sugar water every time!